Days before the SOTU, the Personalized Medicine Coalition (PMC) released its analysis of novel new drugs (NND) approved by the FDA in 2014. They found that 9 of 41 NND -- more than 20% -- approved by FDA were personalized medicines. In a press release, Daryl Pritchard, PhD, PMC's vice president for science policy said, “We have gone from one or two targeted drugs approved each year to a significant amount in 2014....” Which brings us to our topic. As technologies and methodologies that bring personalized treatments into the clinic improve, we're seeing precision approaches to treating diseases like cancer that are getting increasingly, well, precise. Beyond treating cancer based on genetic profiles (i.e., preventive mastectomies for women with faulty BRCA1 genes), researchers are zeroing in on individual patients' particular tumors. One company at the forefront of this approach is New Jersey-based Champions Oncology. Often, the best way to shrink cancer tumors is by using a combination of drugs. However, getting the right combination is challenging. Patients rarely have enough time to test out different combinations, and even early in their treatments, their bodies can't sustain a barrage of different drug combinations in hopes of hitting upon the right one. Champions' approach is to clone patients' individual tumors, implant them in mice, and then test the best treatment candidates simultaneously. The mice act as avatars for the individuals and their particular tumors. They've had some success and last month, Champions Oncology announced that it had secured $14 million in venture funding. 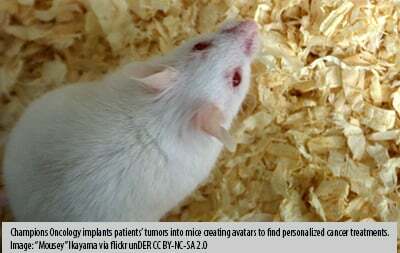 The cloned, implanted tumors are genetically very similar to patients' own tumors and the company reports that some "...70 percent of implanted tumors grow successfully in mice." The process still takes precious time -- up to 16 weeks -- and it is very expensive, with the costs borne by patients because the treatment isn't covered by insurance companies. Not yet. But PMC's aforementioned report gives us hope that personalized approaches are becoming the norm, and that they will be increasingly covered by more of our health plans. We'd bet that he's right.